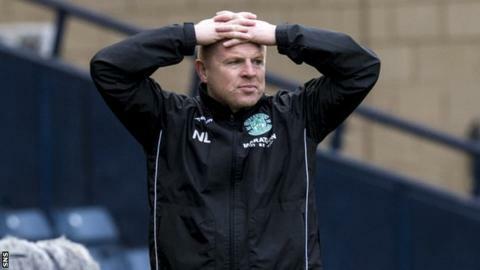 Neil Lennon admits a sloppy first half cost his Hibs side as they were knocked out of the League Cup by Celtic. The Easter Road outfit were 2-0 down at the break, with Celtic's Mikael Lustig having bagged a double, and went on to lose the semi-final 4-2 at Hampden. "We gave them a two-goal head start and you can't do that. You can't give a head start to a team of that calibre," Lennon said. "The second half we played a lot better but were always chasing the game." Anthony Stokes' spot-kick brought Hibs back into it at 2-1 after the break, but substitute Moussa Dembele made it 3-1. Hibs sub Oliver Shaw made it 3-2 before Dembele put the game to bed with his second goal. "The manner of the goals was very disappointing," Lennon said. "But over the course of the game I'm really pleased with the players, some outstanding performances out there. "Just the manner of the goals, just the little things that all add up that we can do better. "I think my goalkeeper will be disappointed with the second one. At 2-0 it leaves us a lot to do." While Lennon highlighted areas for improvement, he was happy with many aspects of Hibs' play. "I didn't think Celtic were causing us any problems," he added. "We had a real good go at it but we have to defend better at times. "I don't want to be gallant losers but I've got to take a lot of positives from the game. The little things that they do better, it all adds up eventually."